Will not mark or mar the hull of your boat. Integrally molded ribs both top and bottom of the wheel makes it valuable dock and boat protection and a formidable guard against impacts. Guides boat into your slip easily, regardless of wind and current conditions. 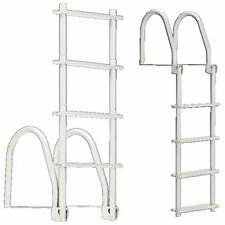 Durable and attractive, this ladder features a hinged design which allows the ladder to flip up and out of the water when not in use. Distance to first step from dock surface: 12". Rail height: 18-1/2" above the dock. Dockguardprofile features a raised lip for gunwale protection on ski and bass boats. Heavy duty marine grade flexible PVC. The forces the line is exposed to are taken up by the elongation of the mooring snubber. Ideal for both motor and sailing boats. Large, durable bumper adds an attractive and functionally rugged cushion to the leg pipes of your docking system. This revolutionary design incorporates a soft expanded polypropylene core surrounded UV stabilized integral skin foam. Connect end to end for longer runs. 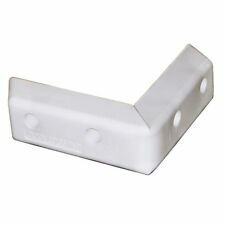 This creates the softest but most durable bumper you can treat your boat to. Can be mounted vertically or horizontally anywhere on the dock face. Heavy duty marine grade flexible PVC. Great for pilings too. E-Z roll inflatable pneumatic tires easily traverse the most irregular surfaces. A rugged and useful addition to your dock arsenal. 300 lbs weight capacity. Cenvenient, removable heavy wall 6.24 cubic ft poly bucket. C guard profile can be used on flat surfaces, corners or pilings. Heavy duty marine grade flexible PVC. The ultimate in protection systems. This revolutionary design incorporates a soft expanded polypropylene core surrounded UV stabilized integral skin foam. This creates the softest but most durable bumper you can treat your boat to. This revolutionary design incorporates a soft expanded polypropylene core surrounded UV stabilized integral skin foam. This creates the softest but most durable bumper you can treat your boat to. Connect end to end for longer runs. Heavy D profile c an be mounted vertically or horizontally anywhere on the dock face. Great for pilings too. Manufactured with 100% virgin material. Auto on at dusk and off at dawn. Powerful solar charging performance and super bright LEDs. Change colors with the press of a button. Ratcheted strap allows quick and easy attaching to rail. Simply squeeze tabs to release fender for storage. Curved profile to make piling mounting easier. Can be mounted on rounded or flat surfaces. Heavy duty marine grade flexible PVC. Mount vertically or horizontally on docks, pilings or boat houses. Developed not to chip or crack under normal usage. Kwik release feature, along with the angled design makes it ideal for pontoon boats as well as docks. Distance to first step from dock surface: 12". Rail height: 19-3/4" above the dock. Manufactured from 1" square aluminum tubing. Mounts easily with three 1-1/2" or 2" screws for a secure mount (not included). Designed to hold your line when not in use to prevent injury from tripping. Each cleat is designed with an extra wide footprint for added strength. Made from marine grade aluminum. Heavy P profile, further reinforced by an internal support. Manufactured with 100% virgin material. Auto on at dusk and off at dawn. Light up your dock, deck or parthways. Attractive, matte finish, corrosion resistant anodized aluminum housing. Stainless steel will prevent unsightly staining caused by rusting of regular steel fasteners. Powerful solar charging performance and super bright LEDs. 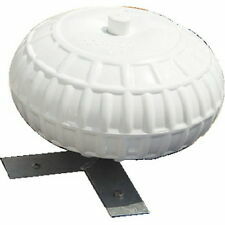 Provides 360 degree illumination for docking your boat or just for dock safety at night. Has a wildlife deterrent spike on top so it will look good for years. Auto on at dusk and off at dawn. 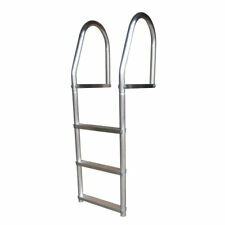 Easily withstands pedestrian and more substantial vehicle traffic such as hand trucks and more. Perfect for docks, walkways, decks and landings. Heavy duty construction and style. Each cleat is designed with an extra wide footprint for added strength. Made from marine grade aluminum and white polyester powder coated. Dock Edge DockSide Bumper 24" x 8 1/2"
Dock Edge DockSide Bumper 24" x 8 1/2". Auto on at dusk and off at dawn. Advanced solar light that is built for 10,000 on / off cycles to provide a long and useful life. Built to withstand foot traffic, can be stepped on without breaking. E-Z roll inflatable pneumatic tires easily traverse the most irregular surfaces. 300 lbs weight capacity. Corrosion resistant aluminum construction. Designed with an extra wide footprint for added strength. Manufactured of cast aluminum. Enlarged counter sunk holes for easy installation with a socket. Stainless steel mounting screws included. Mount vertically or horizontally on docks, pilings or boat houses. Combine with other Dock Edge profiles for total protection. Developed not to chip or crack under normal usage. Heavy slant P profile, further reinforced by two internal supports. Manufactured with 100% virgin material. Piling Bumper - One End Capped - 6' - White. Curved profile to make piling mounts easier. Normalized SKU: 1020F. Available in 6 Ft. Lengths. Mounts easily on curved OR flat surfaces. Protects your boat from dock corners. 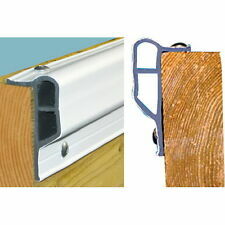 Heavy duty air filled bumper is constructed from marine grade PVC with UV inhibitors and fungicide. Heavy duty marine grade flexible PVC. UV inhibitors and fungicides to prevent fading, yellowing, deterioration from sunlight and unsightly blotching. 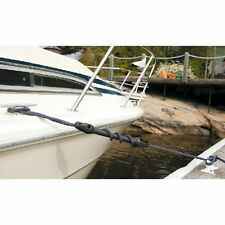 50 ft Dock Edge Brand 1009-F Universal Profile Edging Bumper for Boats New!